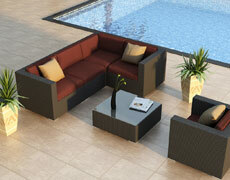 We have just received our shipment of outdoor wicker daybeds and sofas. 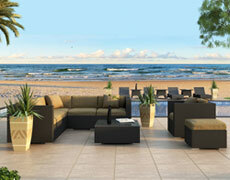 Contemporary and practical, transform your outdoor living space into a an Asian style sanctuary! 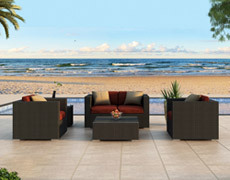 We offer Asian style all weather outdoor wicker furniture that's not just stunning to look but is easy on the pocket book too. Compare with to popular brands, you'll find we offer all the quality and style at almost half the price. 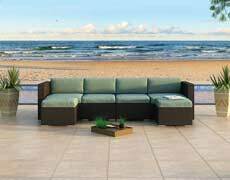 Built from recyclable plastic and durable aluminum our all weather outdoor wicker furniture collection will withstand the elements in style. 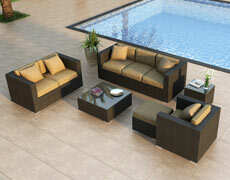 Click on our collection of Asian style outdoor wicker daybeds and sofas for pricing and details. Teak (Tectona Grandis) is a tropical hardwood species indigenous from a variety of Southeast Asian countries including Thailand, Myanmar, Lao as well as India. Teak is known for its exceptional durability and resistance to environmental conditions making it a popular material for Asian Garden furniture and patio sofa. 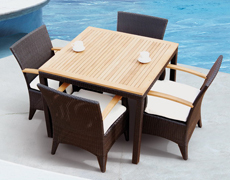 To keep up with the demand for teak furnishings as well as it other uses, teak plantations can be found all around south Southeast Asia as well as Africa and Central and South America. Despite the presence of teak plantations for nearly 200 years, only recently has the increase in demand for teak forced plantation managers to improve production methods. In fact modern techniques can improve an acres yield by nearly 1000%. This improvement has given environmentalists hope of saving natural teak forests. 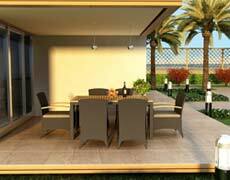 High quality teak outdoor furniture and garden furniture is made of teak that has been hardened through dehydration before production. 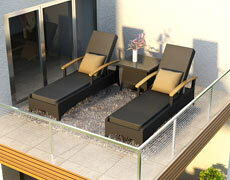 The result is a less porous wood that resist warping from moisture, making it an excellent choice for outdoor use. 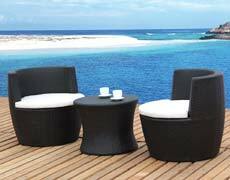 We have just brought in a complete line of poly rattan all weather wicker outdoor furniture. 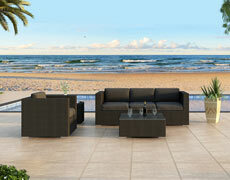 Unlike regular rattan, synthetic rattan is completely weather proof and easy to clean. 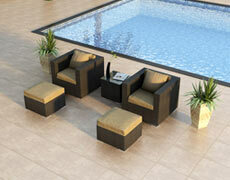 For residential and commercial customers willing to wait, we can special order pieces direct from our factory in Bali. 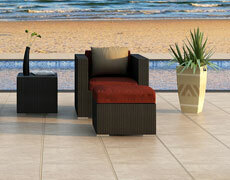 Please contact us to learn about our various wicker outdoor furniture styles, color options and designer pricing.